My Day To-Do was built to make life easy for it’s users and as such it has several useful features to achieve that goal. One of the things that has always been a concern to me is that I have most likely doing a very poor job of making sure that the users know about what these features are. The features are in place to help users and as such if they don’t know about it, they can’t use it, so it is all somewhat pointless and a lot of hard work has gone into it. I know I am not a good designer and I think my best design would be just ‘acceptable’ at best and there’s a good chance of it not being very intuitive. 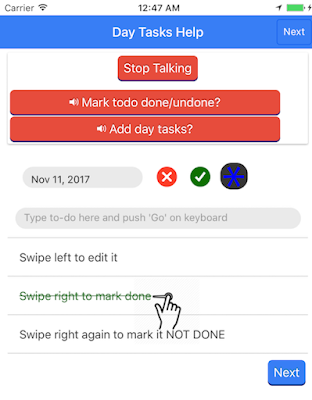 At this stage My Day To-Do is very small and as such there isn’t a dedicated designer, so in this post I will talk about all the things that I tried to make educate the users about all the features of My Day To-Do, taking into account the design limitations at My Day To-Do. What you can expect to read are a chronological list of attempts (techniques tried) to teach users about My Day To-Do and a result of that action and why and what followed after. Attempts such as onboarding (tutorial) and tracking user behaviour via Analytics. I grew up playing FPS and more importantly Real-time Strategy (RTS) games and you know one of the things that I liked about RTS games was they often had a very intuitive way of teaching you how to play the game. The tutorial would be something where they only revel a small section of the interface (UI) to you, and once you follow certain steps and know that part well, they revel other sections of the UI. I thought this was awesome and my dream method of user onboarding i.e. teaching users how to use My Day To-Do would be to have a tutorial like that found in RTS games. Having a tutorial like this is very achievable but very time consuming and given my limited resources at My Day To-Do I decided to choose my first option. 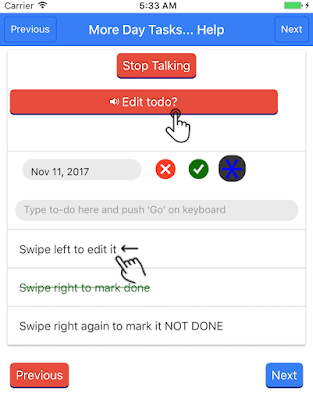 The first attempt at letting users know how to use My Day To-Do was perhaps the worst but hey now, we have to start somewhere don’t we? So what was it? Initially I had a very different website for My Day To-Do (www.mydaytodo.com) and on that website I had a page dedicated to help which had a series of written instructions as well as Youtube videos. You can have a look at a few of those here (how to use the ToDo tab) and here (how to manage recur todos). I thought I may as well provide some minor instructions in certain frames of the video and I was (still am) on a very limited budget so I could not hire professional services to make the video for me so I accomplished whatever I need by learning and using iMovie on my Macbook. So yes I learned (and maybe still know) how to edit videos, modify certain frames, add static text to frames etc etc with iMovie. Anyway since I had a web page with textual and video instructions, I just added an extra tab in My Day To-Do for help in which I had links to the videos and the website. So when a user goes to help section, the user can click any link and be taken to a webpage in Safari or a video on a Youtube app to know how to use My Day To-Do. p.s. The Youtube videos show the first version of My Day To-Do and as such you can still see the help tab over there. Needless to say My Day To-Do looks very very different now. Now I am not sure if this one is better or worse than the first one but at the time I thought it was better and so I tried. Anyway this was essentially a help dialog in the app that would show up as soon as you first start the app. It was a long dialog with text based instructions that you would have to scroll down and read to know about all the features of the My Day To-Do. Unfortunately I don’t have a screenshot to show this right now, but I am sure if you try hard enough you can imagine a long web page with instructions that you have to scroll down to read it all. This is actually what we have right now and as such I can show you some screenshots on what this looks like. The idea is to have a screenshot depicting a certain action as well spoken help i.e. a button with text that describes the action, let’s call it the help button. 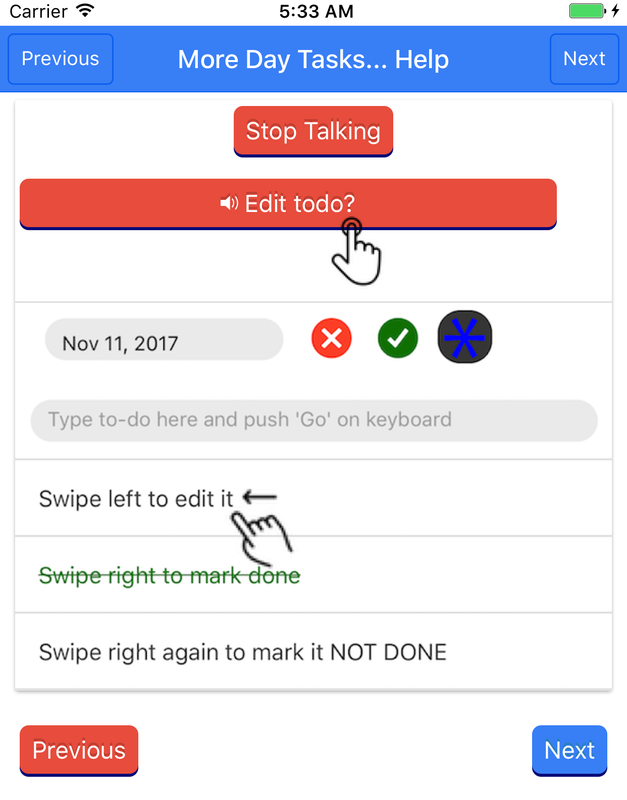 The help button when tapped speaks how to perform that action. e.g. I think that should paint a picture of what’s latest with onboarding in My Day To-Do. Is this perfect? I do not think so but it’s definitely an improvement over what was there before. I have talked about Analytics and My Day To-Do from an architecture standpoint before, if you want to know more about that you can read my post. Anyway at My Day To-Do we are using Firebase for all our Analytics needs. If you want to know more about what Firebase is and what Analytics does for an app, the best place to start are the official docs. 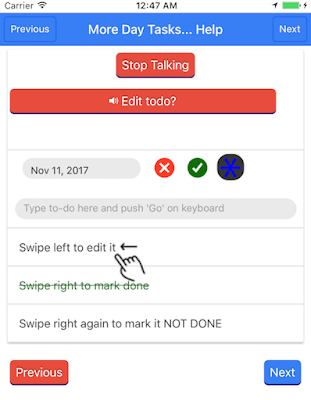 One of the things I wanted to track were the button presses to hear help in the onboarding hence I started tracking the button presses (or tapping, pushing – you get the idea right?) i.e. every time a help button in onboarding was tapped, it would be logged. I called the event for tapped the help button, “IntroSlidesHelpBtnTap”, yeah please try not to analyse the name but at this stage I am the only one analysing the analytics data and it works for me. This time I wanted the buttons to scream (not literally) at the users that ‘TAP ME’, so after giving it some thought to what would make a tap obvious? I reached a conclusion that a visual demonstration of a tap is the best way to go the screenshot below shows what I came up with. As you can see you have a little finger graphic on the help button that tells you that what you see is a button that you can tap. Ohh you cannot see this but the button has some initial CSS3 powered animation i.e. for the first couple of seconds the finger will blink which was my way of giving the users a message that they can tap their finger there. On a side note, in one of the recent changes to My Day To-Do, I made every button 3D and some added some animation so just makes it feel a bit more ‘punchy’ when pushed. The result of this is that for the next couple of months I saw significant increase in the frequency of the ‘IntroSlidesHelpBtnTap’. This has achieved my intended purpose for now, there are still certain aspects of My Day To-Do that I would like to make more clear to the users and I will get to that once I have sorted my other priorities. By priorities I really mean all the other work, trust me there’s no shortage of work to-do (haha to-do, see what I did there?) and at this stage being the only one in my startup, it’s all up-to me to do. I did have some “help” over the summer but as I have talked about in my previous post, we know exactly how well that went. I suppose one of the take aways from this blogpost should be to know your skills and be confident in them e.g. I was confident in my skills of not being a good designer and as such I found a way around it to achieve (not 100% but close…r) my goal of letting users know about how to use My Day To-Do. Anyway when you work very hard on building a product you do it so that it can make ‘life easy’ for your prospective users. 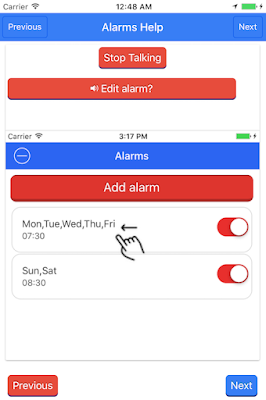 What that involved for me was adding a number of features to My Day To-Do, it does a lot more than your average to-do list app and it was very important for me to know that users know about all that My Day To-Do can do for them. 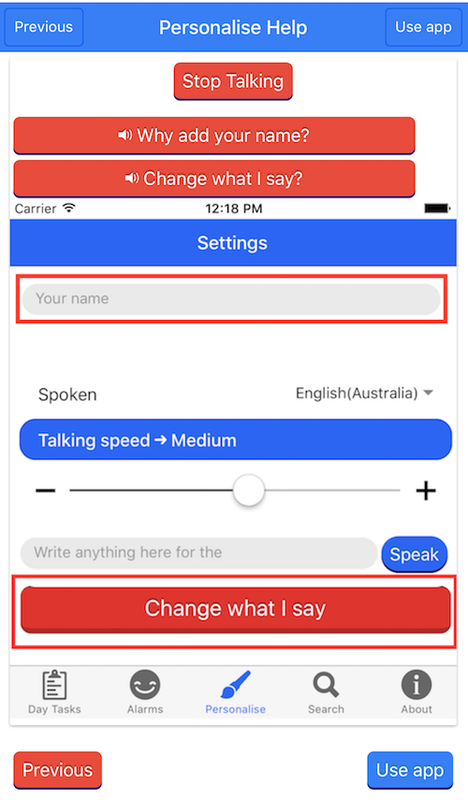 However I wasn’t sure if I can fully ‘educate’ the users about all it’s features, so I started adding in-app help i.e. onboarding features. The onboarding in My Day To-Do went through three iterations from very bad to OK which is where it’s at. Even after adding the onboarding I wasn’t fully satisfied that the users actually know what all that is. So I started tracking user behaviour via Analytics (Firebase) and realised that some of the help in My Day To-Do was not used quite the way it should i.e. limited interaction with the help buttons. Therefore I added more obvious visual cues which increased the user interaction with help. Sounds great doesn’t it? You know after written this blogpost, I have realised that I probably wouldn’t have had to do all this if I had a good designer onboard My Day To-Do. *Sigh* but alas this is how life is for a one person startup, anyway have to keep pushing and fighting the good fight. I can only hope to get to a point where I am at a point where I can hire people to work at My Day To-Do or you know be able to pay my rent or daily expenses from my income at My Day To-Do.